As a consequence of the visit to this Site, the data referring to identified or identifiable people are subject to be processed. 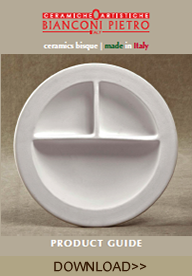 The “Data Controller” of such processing is Pietro Bianconi, Ceramiche Bianconi Pietro S.r.l., Via Flaminia km. 186, 06023 Gualdo Tadino (PG) - ITALY. The processing connected to the Web services of this Site take place with only by technical personnel of the Office responsible for the processing. The computer-based systems and the software procedures involved in the working of this Web site, in the course of their normal service, come into possession of some personal information, the transmission of which is implied in the use of the protocols of Internet communication. In this category of data are included the IP addresses or the names stored in the domain of the computers used by those who access the Site, the addresses in notation URI (Uniform Resource Identifier) of the required resources, the time of the request, the method used to forward the request to the server, the size of the file received in reply, the digit code showing the state of the reply given by the server (good, error, etc…) and other parameters connected with the operating system and the structure and conditions of the user’s computer. This data is used only to get anonymous statistical information about the use of the Site and to check its correct performance and is deleted immediately after processing. The data might be used to investigate responsibilities, should there be any data processing offences against the Site: apart from this possibility, at present the data on Web contacts does not last for more than seven days. The optional, explicit and voluntary forwarding of personal data on this Site implies the subsequent acquisition of the data provided by the sender, which is essential to the procession of the required service. Specific, concise information to data subjects will progressively be reported or displayed on the pages of the Site set up for particular services on demand. No customer data about it is acquired by the web site. C.d. session cookies used in this Site safeguard the navigation discretion and tey don’t acquire personal identifying data. Personal data is processed with automated instruments only for no longer than is necessary for the purposes for which the data were collected or subsequently processed. Specific security procedures are kept to prevent the risk of their destruction or loss, whether by accident or not, of unauthorized access to the data or of processing operations that are either unlawful or inconsistent with the purposes for which the data have been collected. Data subjects have the right, at any time, to obtain confirmation as to whether or not personal data concerning him exist, to know its content and source, to verify its accuracy or to demand its integration, updating or rectification (Art. 7, Legislative Decree 30 June 2003, n. 196). In accordance with said Article, you have the right to ask for the erasure, the anonymization or the blocking of data that have been processed unlawfully, and, furthermore, to object on legitimate grounds, to the processing of personal data, even though they are relevant to the purpose of the collection.